In a community centre in Tai Kok Tsui is a Hung Kuen Academy founded by Australian native Graham Player. 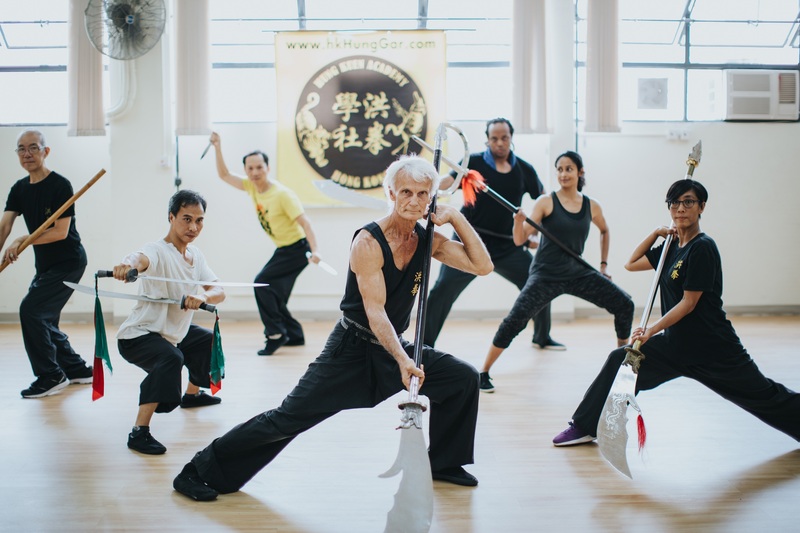 The very idea of a foreigner running a martial arts studio and practising Chinese Kung Fu in Hong Kong always reminds people of Bruce Lee’s influence. In fact, Graham started his martial arts training at the tender age of five when Bruce Lee was but a child actor. His life story is by no means less ordinary than a Chinese Kung Fu novel. Born handicapped in an unforgiving world of discrimination, Graham has tasted wealth and losses. It was Kung Fu that helped him face each of his life hurdles. On a buzzling Victoria Park afternoon, Graham chooses the noisiest spot to go through his Qi training and slow paced routine to improve his concentration. Children stare with curiosity at this white-haired foreign elderly. He is not bothered. 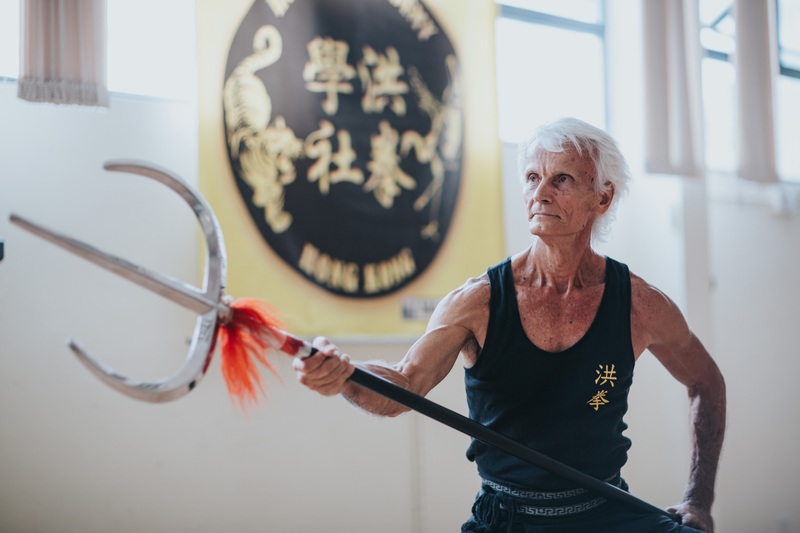 After living with martial arts for more than 60 years, this Hung Kuen master sees the value of martial arts not in winning a fight. Rather, it keeps your mind crystal clear and gives you the calmness to deal with life’s absurdity. The Australian government in the last century ordered a large-scale forced removal of aboriginal children (nowadays referred to as the “stolen generations”) from their families into the care of Caucasian families. With dark skin and black hair, Graham looked nothing like his Caucasian parents. A birth defect of one of his legs also confined his childhood to a wheelchair. A surgery could have set him free eventually but left him an embarrassing limp, which however did not stop him from wanting a normal life. One day, he confided in his elderly neighbour Mr Chan who ran a Chinese restaurant and also suffered discrimination. The two were cut from the same cloth. Chan took the liberty to speak to Graham’s father: “I understand a thing or two about the human physiology. Give me a few years and see if I could help him.” At the time, nobody knew that Chan was a Hung Kuen master or what this particular Kung Fu family was all about. 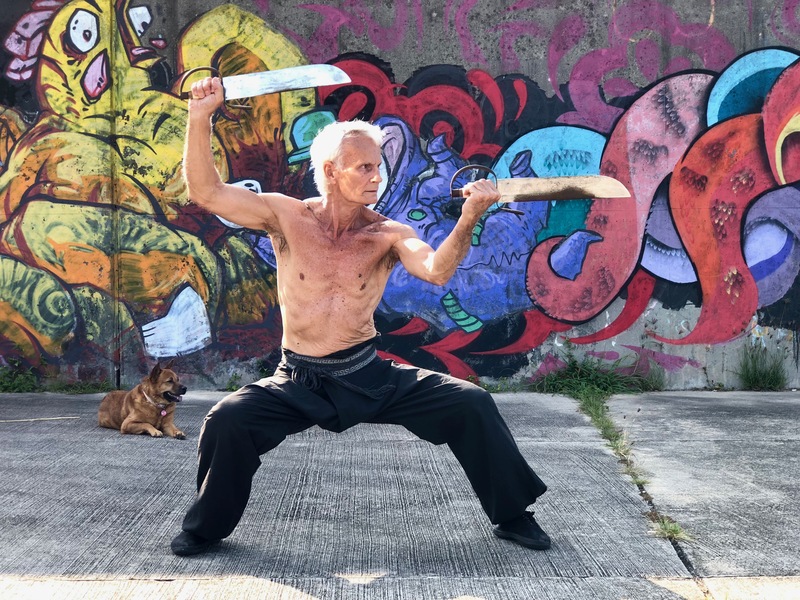 Hung Kuen beginners must master the horse stance for a solid foundation which is commonly known as “solid bridge and horse stance”, before learning Kung Fu styles such as “Gung Gee Fok Fu Kuen” (工字伏虎拳) and “Iron Thread Kuen” (鐵線拳). Through traditional Chinese bone-setting treatments and muscle training, Graham’s leg gradually gained flexibility. Horse stance training became a daily routine for him. At every sign of improvement, Chan would push him further by giving him new exercises. Graham picked up his pace and left behind his crutches as he turned eight. Chan wanted more for him. “Whenever he saw me limping, he would shout: Walk properly! Watch your step!” He was not aware that he was receiving Kung Fu training. One day, Chan brought him to a martial arts studio in China Town. Graham was 12 years’ old. He marvelled at the Kung Fu practitioners’ skilful manipulation of swords and spears. Then and there, he came to realise that he was already a small fraction of a big picture. Chan fixed Graham’s limp and taught him Hung Kuen. He also led him to stand tall in his own shoes. When Graham turned 18, master Chan passed away. The thought of his departure always brings a tear to Graham’s eye. He remembers Chan telling him never stop practising martial arts. The Chinese characters “Kung Fu” convey the essence of “hardship” which is all it takes to master Kung Fu. There is no other way. One must keep repeating the same skills thousands of times until they become second nature. The same applies to any art forms. There are simply no shortcuts. “My resume has two parts. One is IT and the other medicine. The former is for making money and the latter for when I have money.” Martial arts always have a place in Graham’s heart and its value is beyond monetary terms. Graham had a penchant for the medical science. He was helped by Chinese chiropractic so he studied Chinese medicine and subsequently opened a clinic. Years ago, the Australian government sent a squad of medical scientists to China to scrutinise Chinese medicine only to come up with a judgemental conclusion: all Chinese medical theories are unscientific except for acupuncture. In view of the increasingly lucrative acupuncture treatment market, western medical practitioners flocked to the classroom for short courses and started offering treatments to their unwary patients right away. As for Graham, it was a four-year study that combined theories with practice. Patients however went for the western options. He left the medical field a sick with disappointment. Graham has always found himself intrigued by the complexity of everything. When he decided to close his clinic, he took up computer programming, made a successful career out of it, and started an IT firm in the UK. He studied for a doctorate in health science to silence those who think Chinese medicine unscientific. Some time in the 1980s, he sold his firm. 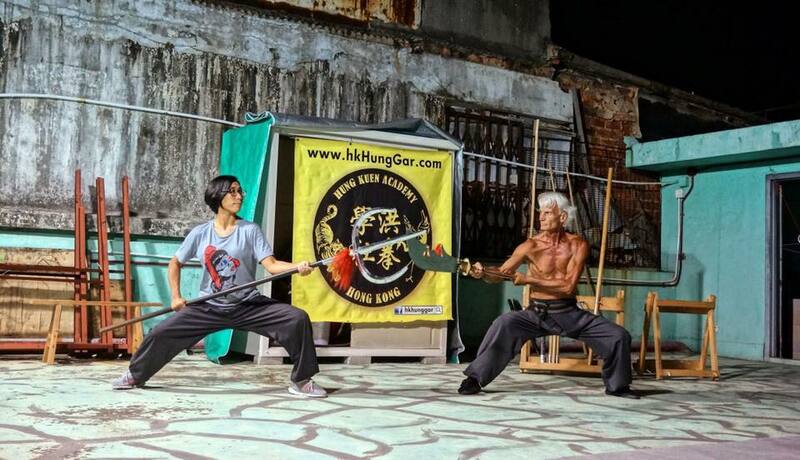 With a cushion of cash tucked comfortably under his arm, he left for Hong Kong in the hope of honing his Hung Kuen skills under the guidance of a master. He thought he would leave after completing his learning. Little did he know, it would be a journey of half his lifetime. Initially, he was training under the roof of the reputable Chan Hon-chung who later developed dementia. He then turned to Chiu Wai the great grand student of Huang Fei-hong’s protégé. His plan was cut short by the financial crisis. Graham’s wealth evaporated overnight. Back on his feet again, he sought employment, opened the IT firm, sold it, and opened a Chinese medicine clinic in Wanchai, which he also closed subsequently. Hung Kuen Academy Hong Kong is now 22 years’ old. Graham had no intention to go it alone in the beginning. It was only after Chiu Wai’s move away from Hong Kong that he started practising at Victoria Park. Prospective learners kept approaching him. The number of his pupils grew and each of them has their own cause. There are many with deep interest with Hung Gar, retirees seeking fulfilment, off-duty workers in need of some exercise, and middle-aged chronically ill patients looking to rebuild a healthy life. There is even a 14-year-old girl. Graham’s reputation drew foreigners as well as Hong Kong locals. He takes any pupil who is earnest about martial arts. Today, Hung Kuen may be diminishing in Hong Kong. Unlike Taekwondo and Judo, its lack of a recognised grading system and qualification somewhat makes it unappealing to the young. Its value, however, deserves recognition. In an era shrouded in negativity, people do need to learn to retain a calm demeanour as Graham preaches.